Numismatic Conservation Services and Numismatic Guaranty Corporation were awarded the exclusive contract for conserving and grading the thousands of SS Republic coins recovered from the 1865 shipwreck site. These gold and silver SS Republic coins were brought to the surface by Odyssey Marine Exploration Inc. of Tampa, Florida. Some of the highlights from this operation are featured here to showcase the amazing work performed by NCS, who professionally conserved these treasures, and by NGC, who performed encapsulation and grading of the SS Republic coins for long-term preservation. 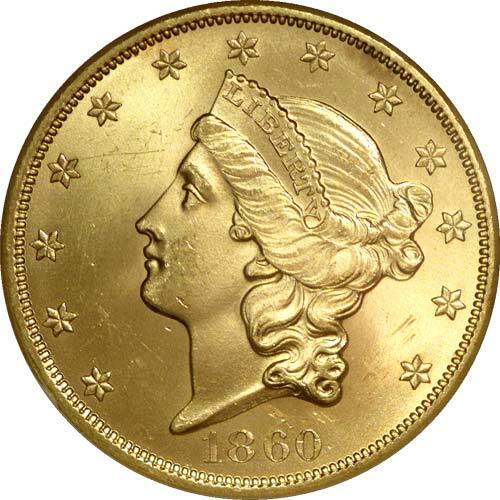 While most of the nation saw few, if any, gold coins after 1861 and for the next 17 years, the inflated, hard-money economy of the West remained on a gold and silver basis. 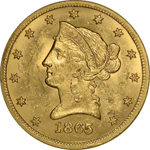 Thus, production of gold coins at the San Francisco Mint did not experience the declines typical of Philadelphia’s Mint during this decade. 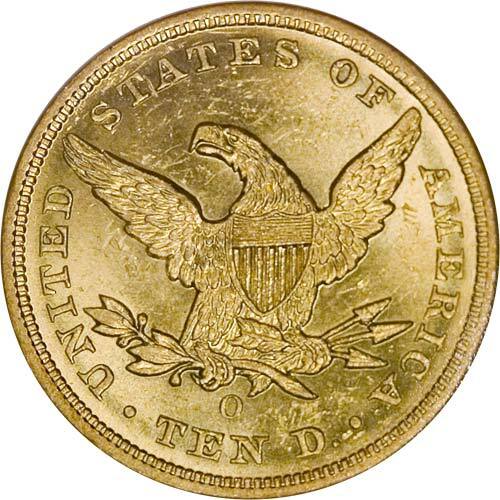 While "S" Mint double eagles were made in fairly large numbers, there were no collectors of these pieces at the time, and only a handful of uncirculated pieces have survived by merest chance. Among these precious survivors are the recently recovered SS Republic coins. This glorious 1863-S twenty is among the very finest of these coins. Not only are its surfaces amazingly pristine, the luster of this piece is simply incredible. Deeply frosty, it almost seems to glow under the light. 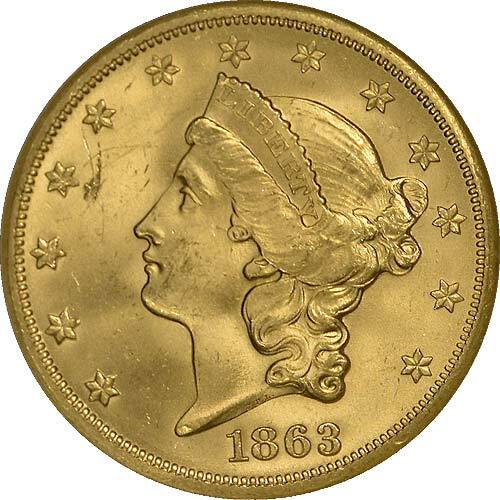 So pretty is this rare coin that NGC awarded it the company’s star designation for outstanding eye appeal. 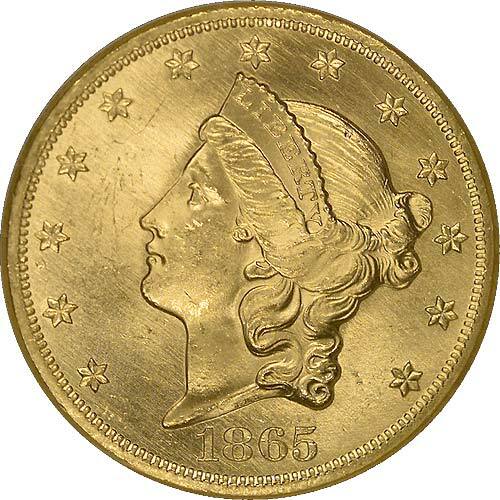 Gold coins ceased to circulate in most of the United States after 1861 and lasting until 1878. The new federal paper money issued at the onset of America’s Civil War soon began to depreciate in relative value, as the notes were no longer redeemable in gold. 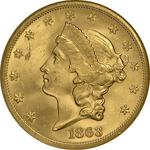 The coining of that metal at the Philadelphia Mint thus declined rapidly, with just 92,098 double eagles being produced there in 1862. 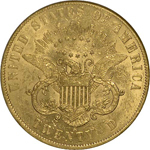 This choice specimen is a great rarity in the USA series. Nearly unknown in mint state condition before the recovery of SS Republic’s treasure, it remains a very elusive issue. 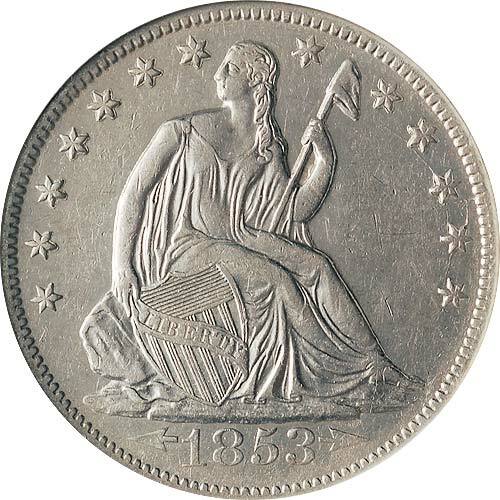 Typical of Philadelphia Mint coins of the 1861-65 period, this example reveals parallel striations in its fields, a consequence of the coining process itself. These in no way detract from the delightful appearance of this rare coin, which also features a couple of mint-made planchet irregularities. Some three-quarter-million double eagles were struck by the Philadelphia Mint in 1854, and this issue is not especially rare in worn condition. Perhaps a couple thousand or more survive, mostly in grades VF and XF. Uncirculated examples, however, are quite rare and likely number less than a dozen. Two different date logotypes were used for 1854, and these are known as the Small Date and the Large Date. This handsome coin is an example of the former, which is the more common of the two in overall numbers. Still a great rarity in mint state, this coin would be an important addition to any collection. Well struck and free of all but a few tiny marks, it has a pleasing appearance. Its bright luster is satiny throughout. 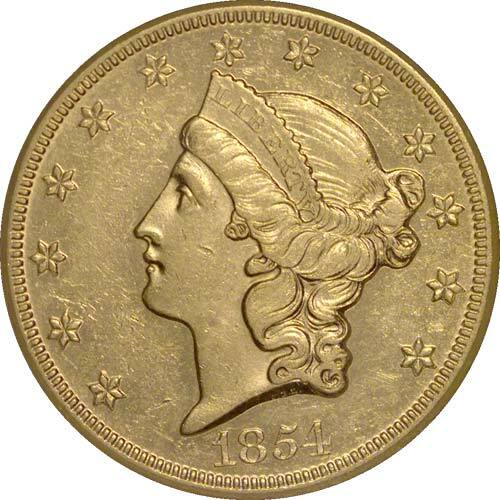 The 1859 New Orleans Mint eagle is an extremely rare coin in all grades. This fact should come as no surprise, given a mintage of just 2,300 pieces! The recovery of this splendid mint state example from SS Republic is a joyous experience that will likely never be repeated. Superbly struck throughout, this fabulous coin is a delight to the eye. There are no marks of any great consequence, and both sides are surprisingly clean. Mostly prooflike fields yield in places to more satiny luster. These dies clashed at some point, and the refinishing performed by mint employees to amend this accident has left a number of interesting raised lines within the shield. 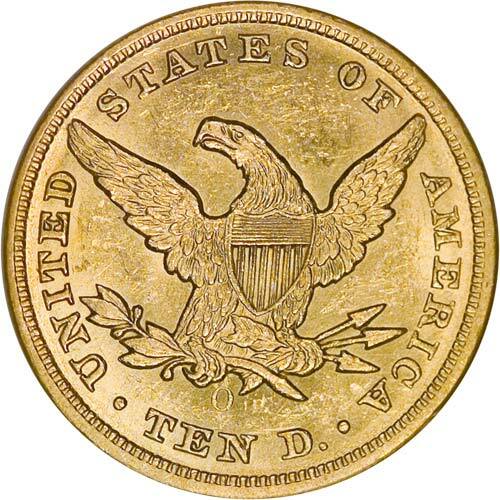 Just 52,500 gold eagles were coined by the New Orleans Mint in 1854. Indeed, uncirculated examples are extremely rare, and this specimen is among a very few certified by NGC. This lovely coin features a very bold strike and unusually clean surfaces for a vintage gold piece. Its luster is satiny overall, with areas of finely grained frostiness at the peripheries. Its historic "O" mintmark is shallowly impressed and might even be overlooked at a casual glance. 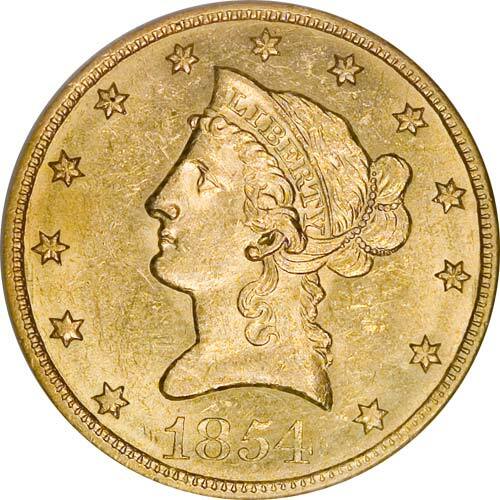 Also not noticeable at first is a distinctive die break hidden within Liberty’s hair above her ear. 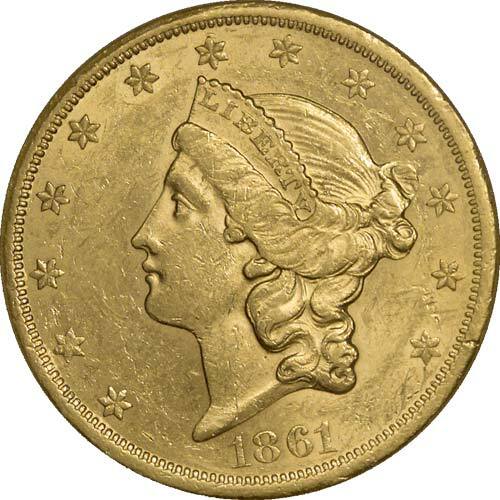 Of the two or three Civil War-era shipwrecks salvaged in recent years, only that of SS Republic is notable for the large number of silver coins found in addition to the expected cargo of gold eagle and double eagles. The majority of these silver pieces are half dollars of the New Orleans Mint, and presented here is one of the more interesting examples. 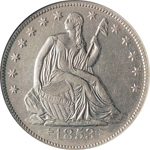 1853 was the year that Congress reduced the weight of our fractional silver coins in response to widespread hoarding. 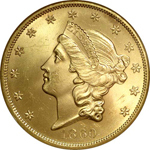 The discovery of so much gold in California depressed its value as measured in silver, and the new reduced-weight silver coins circulated freely. 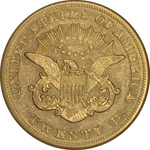 In 1853 only the new coins were branded by the mint, with arrowheads at their dates and a glory of rays on their reverses around the eagle. 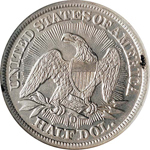 Common in worn condition, examples of the 1853-O half dollar with arrows and rays are quite scarce at or near mint state. This charming specimen is just faintly worn. Fully struck down to the smallest detail, it features bright luster of finely grained frostiness and very clean surfaces. 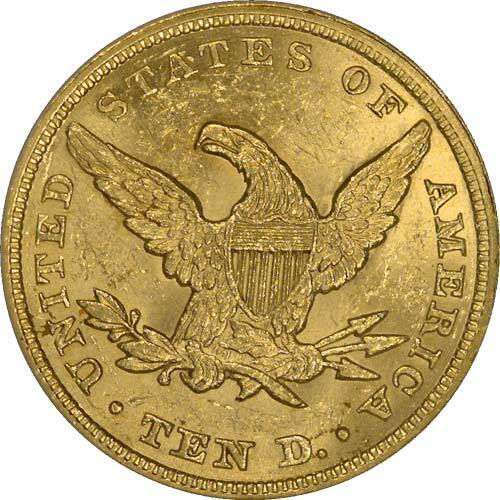 Numismatists will note that its reverse die clashed multiple times and is rotated about 30 degrees from normal. 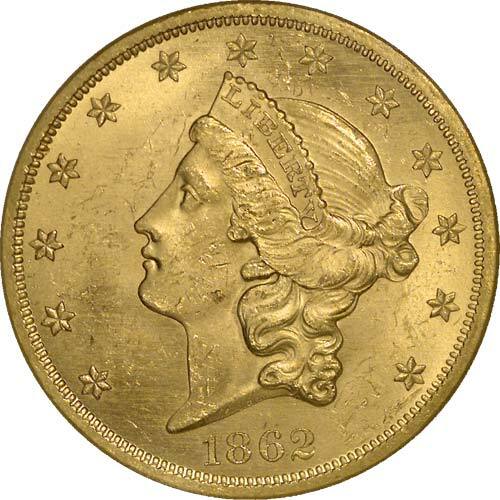 The New Orleans Mint produced some 47,500 gold eagles in 1845, a fairly typical output for that decade prior to the California discoveries of 1848-49. 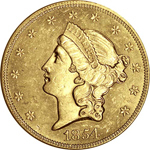 With no collectors of these coins in their own time, precious few examples have survived uncirculated. Indeed, this lovely coin is the second finest piece certified by NGC (as of April 2004), and it bears the highly desirable pedigree of SS Republic. Of additional interest to the numismatist is this coin’s partially repunched date. 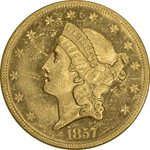 Though Walter Breen did not illustrate his several listings for 1845-O, this one appears to be his B-6869, numerals 84 both being duplicated below the final punching. Somewhat weakly struck at its centers, this mint state eagle is otherwise quite appealing in all respects. Its luster is bright throughout, being mostly satin textured at the centers and more frosty near the borders. Free of all but a few tiny marks here and there, this is a very attractive coin and an important condition rarity. 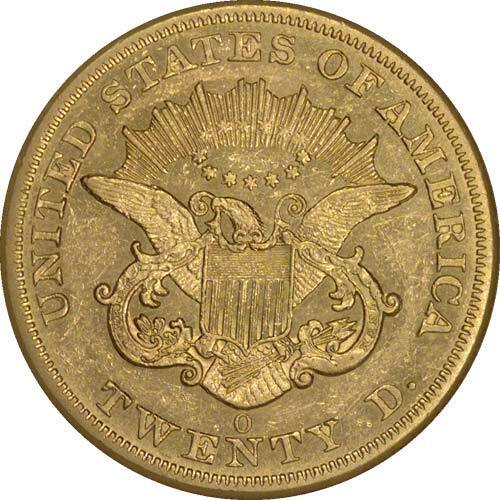 There were absolutely no collectors of double eagles by date and mint in 1865, just a couple dozen proofs supplying the whole demand of the hobby for specimens of this date. 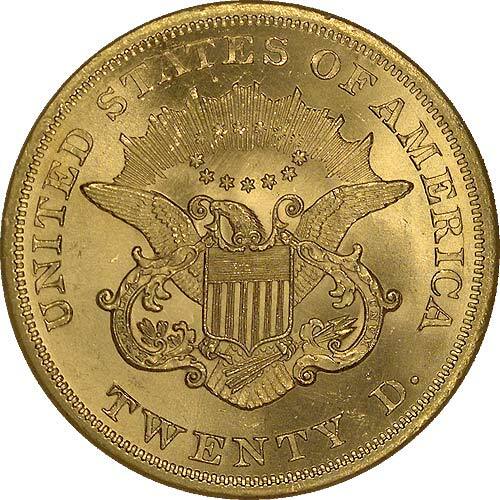 Thus it was that despite a mintage of more than 351,000 twenties at the Philadelphia Mint, this issue remains rare in uncirculated condition. 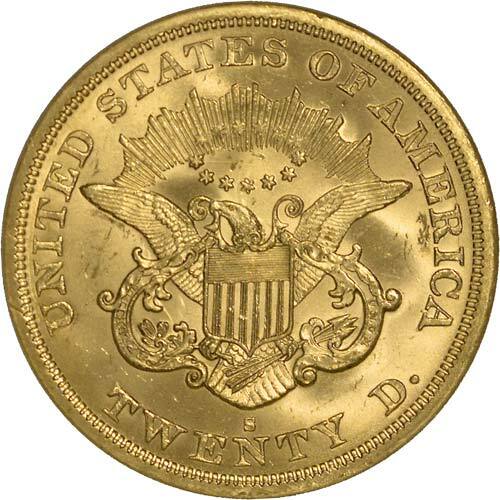 While a few mint state examples of the San Francisco Mint double eagle turned up in another shipwreck, the Philadelphia Mint edition was seldom seen in such condition until now. In fact, this near gem is the finest example yet certified by NGC (as of April 2004), and it bears the NGC star designation for outstanding eye appeal. Fully struck and remarkably pristine, this charming coin is blessed with very bright and satiny luster throughout. Adding to its numismatic appeal is a misplaced date variety. The tops of duplicate numerals 865 are visible within the obverse denticles. This is the second such example to have been recovered from SS Republic's treasure, the other example grading MS 62. The San Francisco Mint coined just over a million double eagles in 1865, so collectors simply wanting an example of this date / mint combination can easily settle for one of the many worn pieces extant. 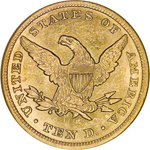 This issue is known with both the Medium S mintmark typical of earlier dates and the Small S, as seen on this example. 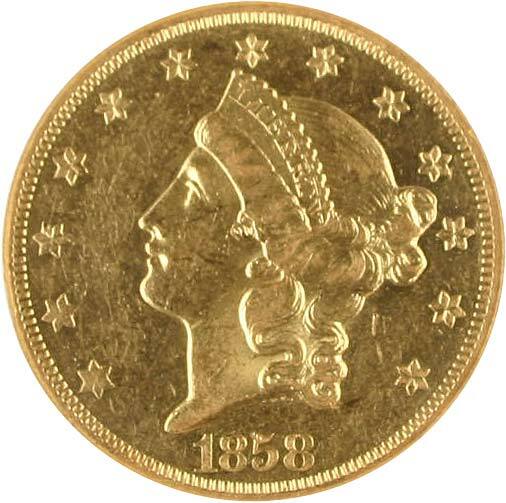 What sets this wonderful coin apart is its outstanding condition. While a number of mint state pieces were recovered in an earlier salvage, that of SS Brother Jonathan, such coins are by no means common. Gems of the 1865-S are very rare indeed, and this coin is the first such condition rarity to emerge from the recovery of SS Republic's treasure. Whether any more of this quality will surface remains unknown at this time. Fully struck in every small detail, this handsome twenty combines deep, frosty luster in its fields with bright, satiny devices. A few small die cracks wind their ways around the stars and lettering, but these are quite unobtrusive. 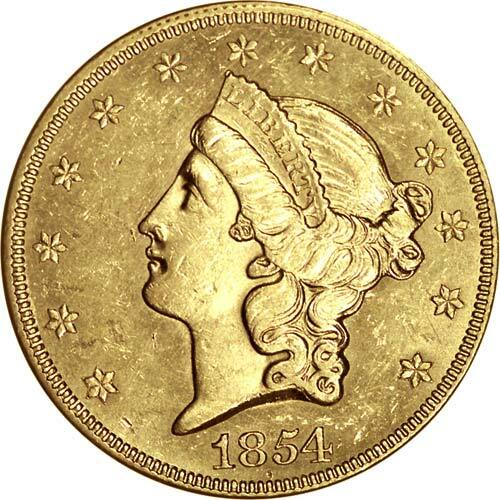 The coinage of gold by the US Mint and its branches was fairly heavy during the early 1850s, as they struggled to absorb the great wealth emanating from California’s newly discovered mines. Philadelphia produced more than 200,000 eagles that year. 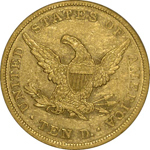 Under such conditions dies were not to be wasted, and the one used to coin this ten-dollar piece had a numeral 3 punched over the existing 2. 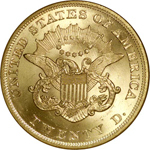 The underlying 2 is still visible within the lower loop of the 3, making this among the most highly sought of gold varieties. Struck from an early state of the dies, all features of the design are plainly evident. Even extra punchings are visible below numerals 1 and 3 of the date. As would be expected, this coin’s luster is satiny, not frosty. 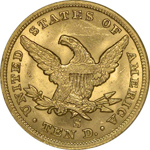 A few planchet striations are visible on its obverse, as made. Lustrous and bright throughout, this coin is very pretty. 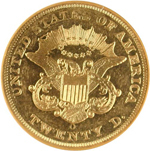 The overdate variety is very rare uncirculated, and this specimen is the second finest certified by NGC (as of April 2004). Whether additional examples await discovery in SS Republic's sea bed remains unknown. 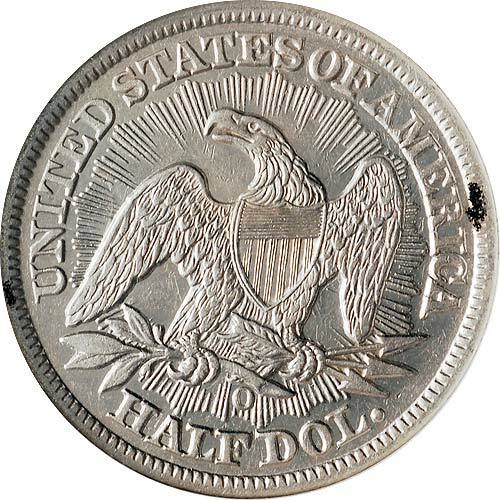 The mintage of double eagles at New Orleans in 1858 was just 35,250 pieces. In an era when the collecting of this series by date and mint was unimaginable, the survival of this issue was a matter of mere chance. Something between 100 and 150 examples are believed to exist today in all grades combined. This choice specimen is the finest yet certified by NGC (as of April 2004) and just the second coin to be graded mint state. Fully struck, its surfaces are alternately satiny and semi-prooflike. Long considered a very scarce issue in the Coronet Double Eagle series, the 1865 Philadelphia Mint twenty may yet become a collectable piece once all of SS Republic's treasure is recovered. 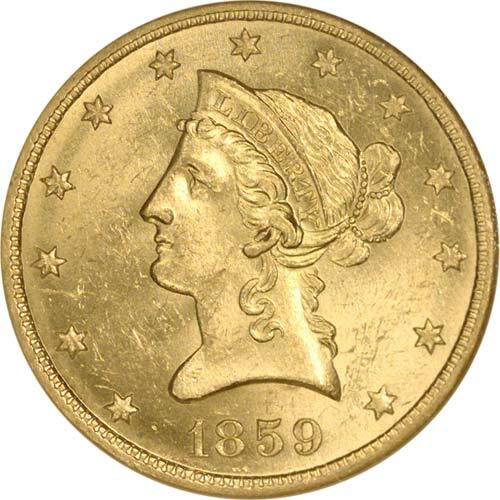 It’s doubtful, however, that any coins will exceed the tremendous quality represented by this incredible beauty. Its bright surfaces reveal numerous fine die-polishing lines and are laced with tiny, meandering die cracks. Bearing the NGC star designation for superior eye appeal, this amazing gold piece looks just as it must have when the ship went down some 140 years ago. 1838 was the first year of Christian Gobrecht’s new Coronet Head of Liberty, and it debuted on the gold eagle. 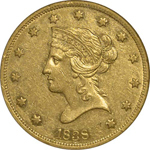 This familiar portrait was adapted to the lesser gold denominations over the next couple of years, and it was even used in modified form on the cents of 1839-57. This exact portrait appeared on the eagle only in 1838-39 before Liberty had her hair restyled midway through 1839. 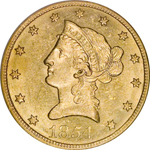 It is thus a two-year-only type coin and is in constant demand from type collectors. A mere 7,200 eagles were coined in 1838, and this date remains rare in any grade. That a choice, nearly uncirculated example would be found among the treasure recovered from SS Republic is nothing short of amazing. 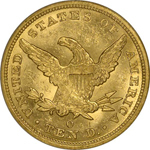 NGC has certified only two pieces finer (as of April 2004). 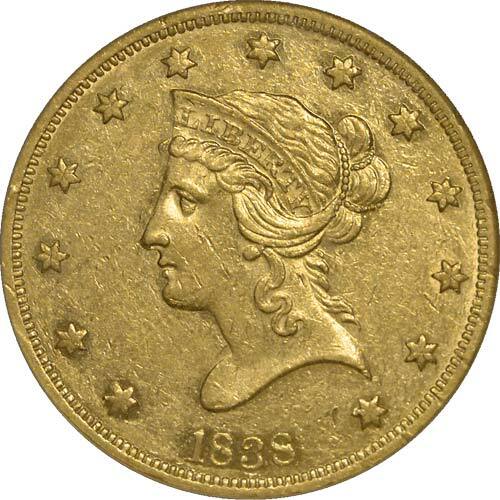 This fabulous coin is well struck and free of serious marks. As minted, its fields were deeply prooflike, though some of this surface has been diminished through contact with other coins. Where the fields are protected by elements of the design, this prooflike brilliance is simply delightful. This is a very important rarity in its own right, but it is especially desirable as a historic memento of SS Republic. The obverse master hub for this coin type was modified in 1859 to address imperfections with the adopted type of 1850. This example from 1860 shows these changes to fine effect. For example, the designer’s initials “J.B.L.” are completely readable, unlike earlier issues on which they are often incomplete. More than half a million double eagles were coined at the Philadelphia Mint in 1860, enough to make this issue readily collectable in worn condition. Uncirculated examples, however, are scarce, while a gem of this quality is almost unimaginable. Indeed, this amazing coin is the very finest piece certified by NGC (as of April 2004). Fully struck throughout, this beauty was coined from fresh and unflawed dies. Its satiny luster is almost completely undisturbed by marks, so pristine is this lovely gold piece. Completely untoned, it appears just as it must have when minted on the eve of America’s Civil War. 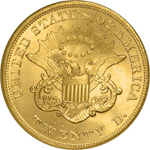 Only 30,000 double eagles were coined by the New Orleans Mint for 1857, and absolutely no thought was given to preserving examples by the collecting community of that time. 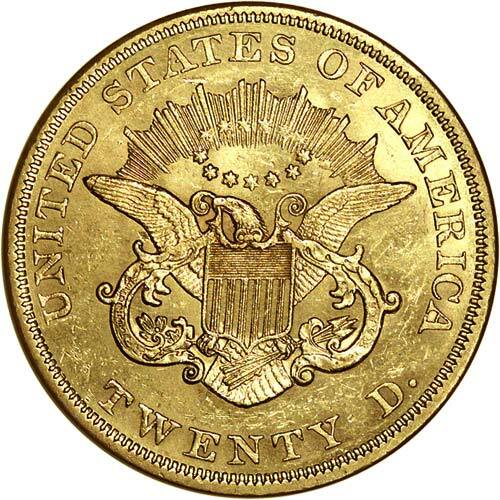 Twenty dollars was a lot of money to tie up in a coin that would not increase in value for generations. So little interest was shown in this series that not even proofs of the double eagle are known with the date 1857. 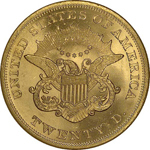 This 1857-O twenty-dollar piece is just as described in Walter Breen’s mammoth encyclopedia of US and colonial coins. 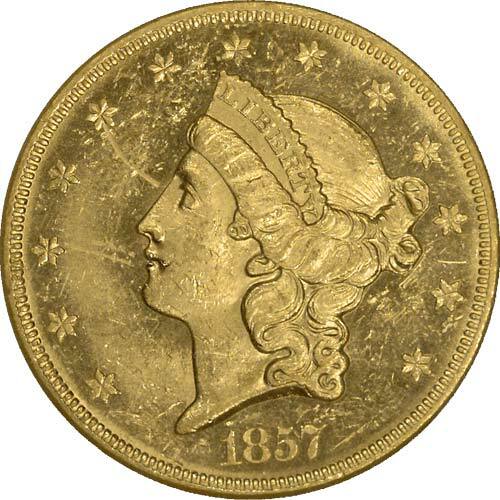 It has a thin, shallow mintmark and a few rust pits in the obverse die just to the left of Liberty’s ear. 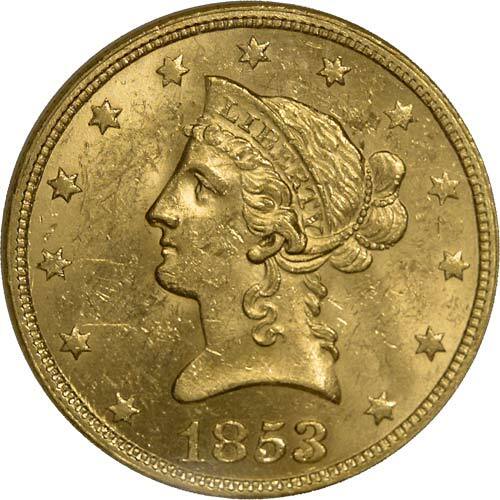 These features are easily studied, as this remarkable coin is one of a very few mint state examples known and the very finest one certified by NGC (as of April 2004). Well struck and free of serious marks, this lovely coin blends prooflike reflectivity and frosty luster. It may ultimately prove to be the finest surviving example, but this remains to be seen, as Republic is still revealing her secrets. 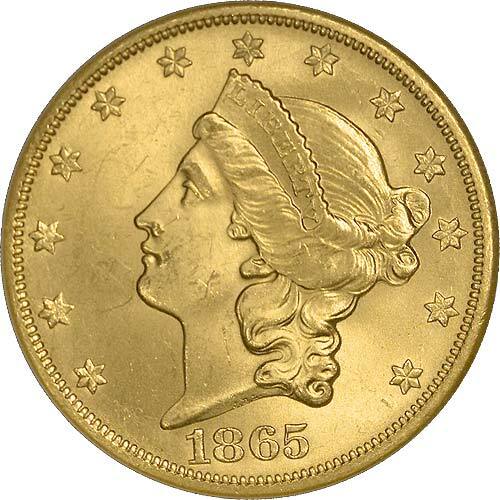 The San Francisco Mint coined only 16,700 gold eagles in 1865, so this date was destined to be very scarce in any grade. Before the recovery of SS Republic’s treasure this issue was virtually unknown in mint state. Indeed, this is the first uncirculated example certified by NGC. More than that, however, it features a very rare and highly desired variety. Numerals 186 of the date were first applied to the die upside down and then corrected. The first punching is clearly visible on this lovely coin. Ablaze with bright, satiny luster, this splendid rarity is a true prize. Among the keys to completing a series of Coronet Double Eagles is the very rare 1861 San Francisco Mint twenty with the distinctive Paquet Reverse. Unknown in mint state, this lustrous specimen is as fine as they come. While perhaps a hundred survivors are known of the 1861-S Paquet twenty, most are heavily worn and / or damaged. This choice, nearly mint example would be the highlight of any collection of Coronet Double Eagles. 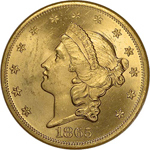 The US Mint made mostly minor modifications to all coin types between 1858 and 1861. Far more obvious than most of these is Anthony C. Paquet's interpretation of James B. Longacre's original reverse design of the double eagle. 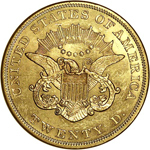 For the coinage of 1861 Paquet replaced Longacre's well proportioned lettering with his own brand of tall, severe letters. 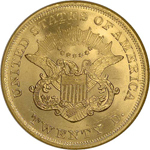 His modified reverse dies were supplied to the branch mints at San Francisco and New Orleans before being properly tested at Philadelphia. They quickly proved unsuitable, and their use was halted, but not before San Francisco coined and issued just 19,250 pieces. 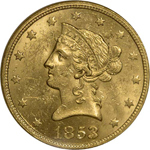 To date, NGC has graded no 1861-S Paquet $20 in any higher grade than this coin, tying it for finest known. 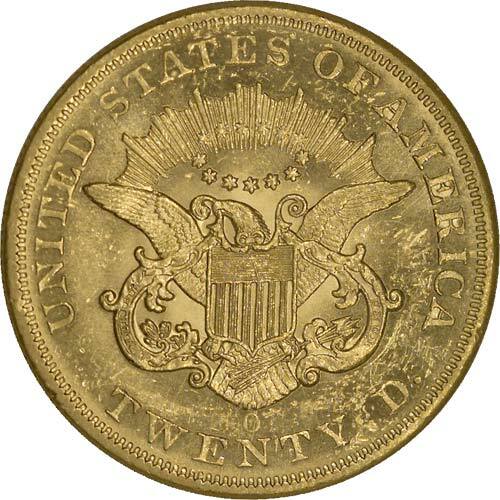 The 1854-O double eagle is a tremendous rarity today, with no more than 25-30 examples known in all grades. Even some of the most notable collections of the past have lacked this elusive issue. 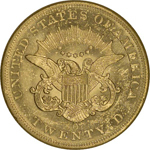 To date, no uncirculated pieces have been confirmed, and VF-XF is the typical grade range for this important Double Eagle. By the mid-1830s, westward expansion coupled with a gold rush in the Appalachian Mountains had begun to stretch the small supply of money in the Southern United States to its limit. In 1835, public outcry prompted Congress to pass legislation establishing a trio of Branch Mints in the South. 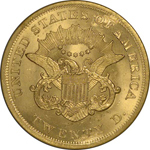 The longest-lived of these, the United States Branch Mint at New Orleans, would begin striking coinage in 1838. 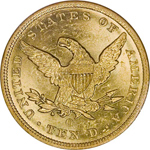 Prior to the Civil War, New Orleans was a major port of entry for gold and silver bullion from Latin America; it also received much of the newly mined gold coming from California. For several years, much of this bullion was converted to coin at the New Orleans Branch Mint. 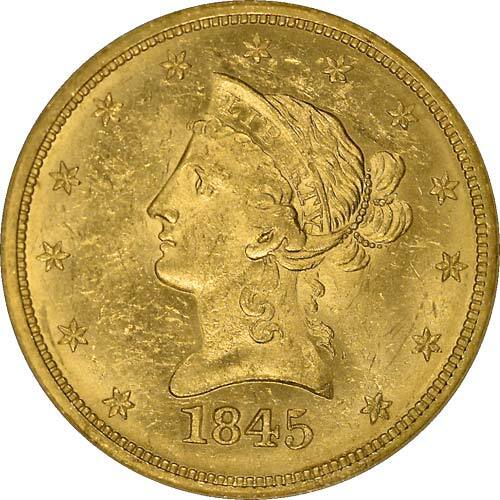 In April of 1854, a mint was established at San Francisco, allowing California gold to be coined almost as soon as it left the ground. As a consequence, deposits of gold at the New Orleans Mint dropped, and only 3,250 double eagles were struck there in 1854, among the lowest mintages recorded for 'O' Mint twenties. The remarkable quality of the specimen presented here is thus a banner headline in American numismatics. Having been recovered just recently from the wreck of SS Republic, it is previously unknown to the hobby and uncounted in any census. Its great rarity as a date, combined with its historic provenance, assures that it will receive a wealth of attention from the collecting community.